Push notifications are alert-style messages that appear at the top or bottom-right corner of your web browser. On a smartphone, they appear at the center of your screen. 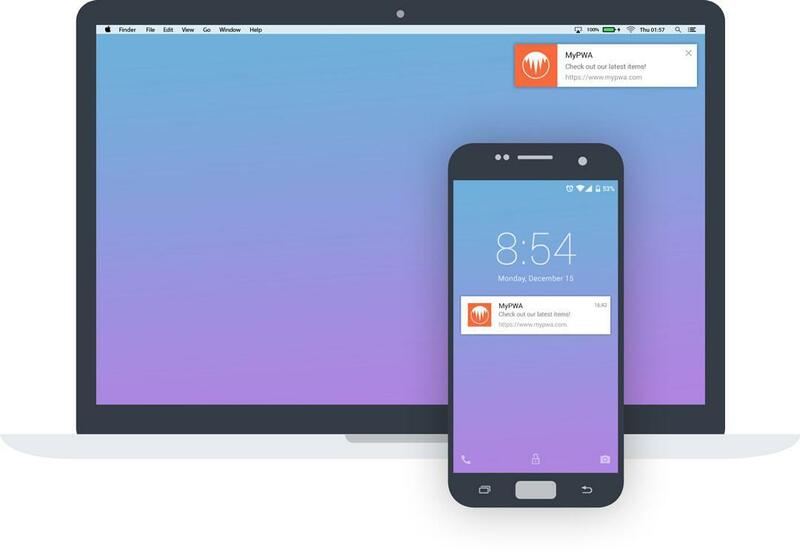 Push notifications provide value and convenience to browser and smartphone users. Push notifications allow marketers to reach prospects and customers directly. I’m a big fan of push notifications both as a marketer and a web user. Push notifications let me become aware of major developments, messages or updates immediately. A push notification is sent from the server of the merchant, marketer or developer directly to the browser or smartphone of the user. How does Push Notifications works? There are three actors involved with delivering a push notification, along with a fourth, optional, component for advanced functionality. Push Notification Service: Each browser, including Chrome, Safari, and Firefox have their own notification delivery service. Chrome uses Google Cloud Messaging ( and now Firebase Cloud Messaging ), Safari uses Apple Push Notification Service ( APNS ) and Firefox uses MDN servers. Service Worker Registration: Developer must register the service worker on the browser. This is only for Chrome and Firefox. Safari does not support service workers. User’s Subscription ID: Subscriber ID is generated when a user opts in to receive notifications from a specific website. Additionally, an SDK (OS client library Software Development Kit) can be added to a web app for extended segmentation and analytics capabilities. Push notifications are an immediate way of correspondence with target audiences. Publishers should treat the capacity to correspondence with clients through website Push Notifications as a facility, not as a right. They must offer some benefit; on the off chance that they do not; push notifications will be disregarded or killed. A few clients will uninstall the application out and out. Push Notifications are a strictly permission-based medium and the opt-in acts as the first touchpoint with a new visitor. Similarly, these notifications ensure that it isn’t difficult to opt out either. This way the subscriber feels empowered to have the choice of receiving or avoiding messages, and you can target only the interested prospects. How you craft your message and communicate it to your readers is important. That’s why your notification titles and messages should be unique and interesting. Write a catchy title, and keep the content crisp. Remember that your users can be in the middle of something and the notification will flash momentarily on their screens. Short and concise messages make it easier to connect. Power words and effective CTA can lead users to take the desired action that you want them to perform. Many mobile apps have a lot of potential users who have downloaded the app but don’t use it. Push notifications are a good way to turn these inactive users into active users. According to a study by Urban Airship, sending even more (high value) push notifications can increase app retention rates by 3 to 10 times. Actually, the retention rate for users who opt into mobile notifications is much higher on average. Through notification messages, you can provide your users with thoughtful reminders, personalized offers, and breaking news. If your mobile notifications can show direct personal value, you’re much more likely to retain users for the long term. Mobile apps can ask for a user’s permission to access their location. If they grant it, you’ll get a great opportunity to personalize the customer experience with location-specific push notifications. A mobile app can send offers that are applicable to users in a specific region based on their time zone. You can target users according to the country, state or city. For example, Waze does a good job reminding its users of nearby traffic situations and providing gas station updates like the gas price. Moreover, you can alert users to discounts or specials when they’re in a particular location. Push messages based on a user’s location can help you engage users with a high degree of personalization and relevance. You can also send push notifications to users based on their interests. Like Netflix, you can use the app and audience data to reach the right users. Netflix sends push messages to users who may be interested in a show. For example, you might receive a notification that a drama is now streaming while other people are alerted that a new season of Game of Thrones is up. It’s all about targeting the right audience. Push notifications can be focused on the particular segments of your client base, and even can be customized for particular application clients. This is a noteworthy advantage when contrasted with SMS text messaging. Be that as it may, these website push notifications additionally require the management of user identification data along with some sort of interface for composing messages, focusing on them and sending them to ensure guaranteed conversions.